Fourteen beautiful little ducklings on our pond this week! Spring is definitely in the air. August was a good reading month. 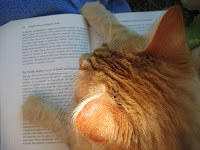 I managed to combine watching the Olympics with reading and finished several lighter books. Austen in August was another great event (thanks Adam) and I supplemented my reading of Persuasion with Jane Austen's Letters and browsing through several other non-fiction books of the Regency era and enjoyed the whole Austen experience immensely. Clarissa in August......I'm not writing any more separate posts for Clarissa until it's finished. Still reading, still a few days behind.....hard work at times! Crime Fiction Pick of the Month - a meme from Kerrie @ Mysteries in Paradise. I'm starting the month with a few days off - not that anyone will notice as I have a couple of posts scheduled. R.I.P VII hosted by Carl @ Stainless Steel Droppings runs from Sept 1 to Oct 31........always a popular event so check it out. The annual Rotary Club Book Fair begins on the 19th and runs for four days which will be fun as always. Last week I packed up my box of donated books and delivered them so I have some gaps on the bookshelf to fill. I hope everyone has a wonderful September! Thanks - and the same to you! I hope you enjoy your days off :) I just received a used copy of Ngaio Marsh's Died in the Wool :-) That will be the next vintage mystery. Congratulations on your ducklings..I love watching birds! I will! The ducklings are lovely to watch and mother is so protective. Hope you will enjoy Died in the Wool.